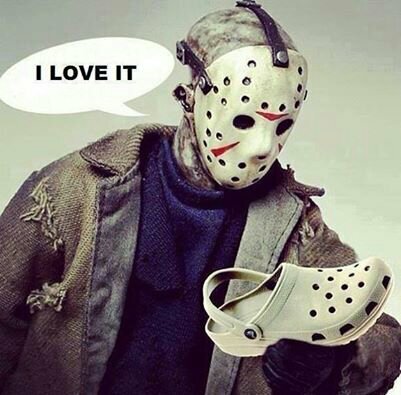 I’ve never owned a pair of crocs but if they made limited edition Friday the 13th ones with the lil red triangles… And blood… And light sensors that played the theme music from Friday the 13th when you walked in the dark…. You’d have to cut them off my feet with a machete…. This entry was posted in Amazing, Scary and tagged Friday the 13, horror, jason, movies. Bookmark the permalink.